Regulator Inlet Angle Adapter - GAS IT Leisure Gas Bottles, Gas Cylincers and Gas Tanks - Catering, Motorhome, Campervan, Caravan, Farrier and Road Repair Refillable Gas Solutions. If you need to alter a regulator W20 inlet to an angled inlet to create space above it or if you want to mount an auto changeover valve at an angle to the regulator rather than directly to it then this W20 elbow fitting will solve your problem. 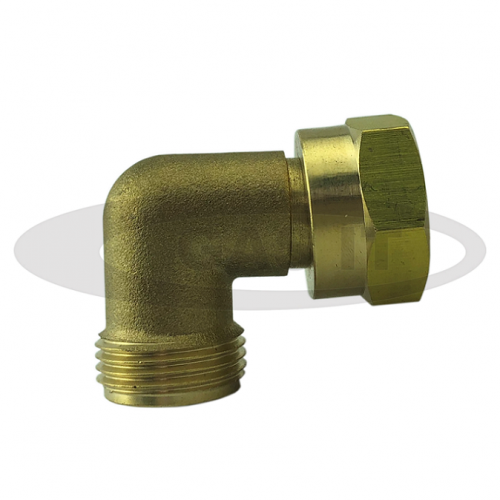 It is a top quality brass angle elbow adaptor with a male W20 on one end and a female W20 on the other. It will connect to the W20 fitting where a pigtail usually connects to.